Hiring? Toptal handpicks top Ember.js engineers to suit your needs. Ember.js is a comprehensive framework for building complex client-side applications. One of its tenets is “convention over configuration,” and the conviction that there is a very large part of development common to most web applications, and thus a single best way to solve most of these everyday challenges. However, finding the right abstraction, and covering all the cases, takes time and input from the whole community. As the reasoning goes, it is better to take the time to get the solution for the core problem right, and then bake it into the framework, instead of throwing up our hands and letting everybody fend for themselves when they need to find a solution. Ember.js is constantly evolving to make development even easier. But, as with any advanced framework, there are still pitfalls Ember developers may fall into. With the following post, I hope to provide a map to evade these. Let’s jump right in! Routable components will be coming to Ember shortly, probably in version 2.1 or 2.2. When they land, the model hook will always be called, no matter how one transitions to a route with a dynamic segment. Read the corresponding RFC here. Routes in Ember.js set up properties on controllers that serve as the context for the corresponding template. These controllers are singletons and consequently any state defined on them persists even when the controller is no longer active. This is something that is very easy to overlook and I stumbled into this, too. In my case, I had a music catalogue app with bands and songs. The songCreationStarted flag on the songs controller indicated that the user has begun creating a song for a particular band. The problem was that if the user then switched to another band, the value of songCreationStarted persisted, and it seemed like the half-finished song was for the other band, which was confusing. Again, the dawn of routeable components will solve this problem, bringing an end to controllers altogether. One of the advantages of routeable components is that they have a more consistent lifecycle and always get torn down when transitioning away from their routes. When they arrive, the above problem will vanish. 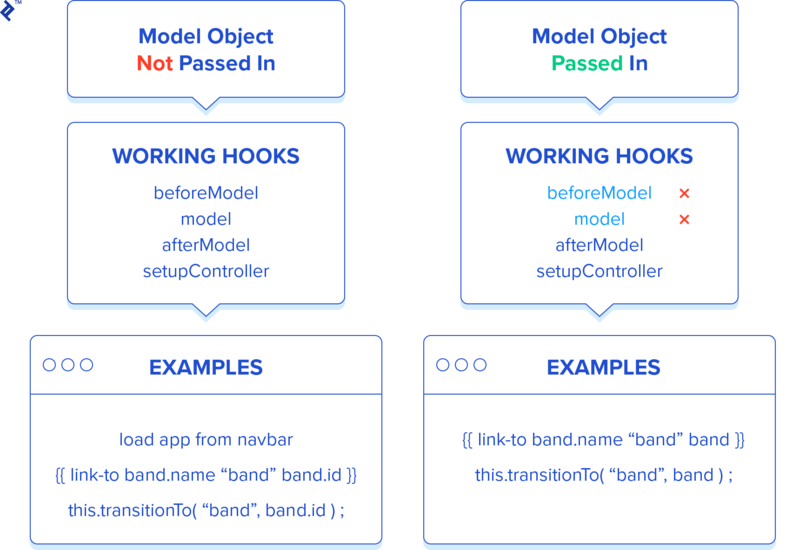 Routes in Ember have a handful of lifecycle hooks to define application-specific behavior. We already saw model which is used to fetch data for the corresponding template and setupController, for setting up the controller, the template’s context. As stated before, controllers, and with them, the setupController hook, are going away soon, so this pitfall will be a threat no longer. However, there is a greater lesson to be learned here, which is to be mindful of implementations in ancestors. The init function, defined in Ember.Object, the mother of all objects in Ember, is another example you have to watch out for. Given a URL of /bands/24/songs, the model hook of bands, bands.band and then bands.band.songs are called, in this order. The route API has a particularly handy method, modelFor, that can be used in child routes to fetch the model from one of the parent routes, as that model has surely been resolved by that point. Our method to fetch the band designated in the URL would break, as the bands route is no longer a parent and thus its model has not been resolved. return bands.filterBy('id', params.id); // => error! The solution is to use modelFor only for parent routes, and use other means to retrieve the necessary data when modelFor cannot be used, such as fetching from the store. Nested components have always been one of the most difficult parts of Ember to reason about. With the introduction of block parameters in Ember 1.10, a lot of this complexity has been relieved, but in many situations, it’s still tricky to see at a glance what component an action, fired from a child component, will be triggered on. Let’s assume we have a band-list component that has band-list-items in it, and we can mark each band as a favorite in the list. The action name that should be invoked when the user clicks on the button is passed into the band-list-item component, and becomes the value of its faveAction property. When the user clicks the “Fave this” button, the faveBand action gets triggered, which fires the component’s faveAction that was passed in (setAsFavorite, in the above case), on its parent component, band-list. That trips up a lot of people since they expect the action to be fired the same way that actions from route-driven templates are, on the controller (and then bubbling up on the active routes). What makes this worse is that no error message is logged; the parent component just swallows the error. The general rule is that actions are fired on the current context. In the case of non-component templates, that context is the current controller, while in the case of component templates, it is the parent component (if there is one), or again the current controller if the component is not nested. So in the above case, the band-list component would have to re-fire the action received from band-list-item in order to bubble it up to the controller or route. If the band-list was defined in the bands template, then the setFavoriteBand action would have to be handled in the bands controller or the bands route (or one of its parent routes). This is made simpler by the “Improved Actions RFC”, which is already available on the master branch, and will probably be included in 1.13. Let’s extend the (now fixed) example from Common Mistake No. 6, and create a User class in our application. user.get('isAdmin'); // => false ? user.get('isAdmin'); // => true, finally! Imagine we have a star-rating component which displays an item’s rating and allows the setting of the item’s rating. The rating can be for a song, a book or a soccer player’s dribble skill. That would get the job done, but there are a couple of problems with it. First, it assumes that the passed in item has a rating property, and so we can’t use this component to manage Leo Messi’s dribble skill (where this property might be called score). Second, it mutates the item’s rating in the component. This leads to scenarios where it is hard to see why a certain property changes. Imagine we have another component in the same template where that rating is also used, for example, for calculating the average score for the soccer player. The slogan for mitigating the complexity of this scenario is “Data down, actions up” (DDAU). Data should be passed down (from route to controller to components), while components should use actions to notify their context about changes in these data. So how should DDAU be applied here? When this happens, this change is propagated downwards through the binding passed to the star-rating component, and the number of full stars displayed changes as a result. This way, mutation does not happen in the components, and since the only app specific part is the handling of the action in the route, the component’s reusability does not suffer. It is important to note that some (most?) of the mistakes I have seen people commit (or committed myself), including the ones I have written about here, are going to disappear or be greatly mitigated early on in the 2.x series of Ember.js. What remains is addressed by my suggestions above, so once you’re developing in Ember 2.x, you’ll have no excuse to make any more errors! If you’d like this article as a pdf, head over to my blog and click the link at the bottom of the post. I came to the front-end world with Ember.js two years ago, and I am here to stay. I became so enthusiastic about Ember that I started blogging intensely both in guest posts and on my own blog, as well as presenting at conferences. I even wrote a book, Rock and Roll with Ember.js, for anyone who wants to learn Ember. You can download a sample chapter here. Great write-up! I've been caught many times by most of those gotchas. Just a quick correction on `// app/routes/player.js` under common mistake #8: it should export `Ember.Route.extend`, not `Ember.Component.extend`. Already in touch with toptal but let me thank you for your utmost professional inside view sharing with the world. Lets crowd for real in a society longing for participative economy. Regards. Horst. Mainstap Holding. No problem, Horst, I enjoyed writing this article. I just checked Ember, looking at Enumerables API (http://guides.emberjs.com/v1.12.0/enumerables/); seems ill-designed. I’m confused by #8, I thought bound properties were 2 way bindings. Therefore you could just set “rating” in the action and it should also set the bound “item.score”. Right? Balint can probably explain this better but you could do all the manipulation in the component with the properties. However the component wouldn't be as reusable. One idea behind data down, actions up is that you can pass the manipulation of the data up to the route to handle it. In this example your component then can be re-used, by just changing the "setaction" to point to a different action for the data to be sent to in the component. It's a little more cleaner. Thank you Marty! This has been corrected. In common mistake #2, I prefer to define a reset action in the controller which I call from the setupController hook rather than set the controller properties directly. In my opinion this is a cleaner division of responsibilities in that the controller is more knowledgeable and thus better able to reset its own properties to the correct defaults. That's a very good point, and actually how I did it in a recent project (where we needed to reset the form fields when the user left the route). Well, we learn every day :) I did not know that hook although I see that it has been introduced in 1.7. That's exactly what we want, thank you, @andreoua:disqus! The Enumerables API in 1.13 is written such that it can be swapped out for the ES6 Enumerables when those land. The extra Enumerables stuff is in EnumerableUtils. Thank you for this! #3 has been a problem for me for a long time, and as a new Ember developer, I just couldn't understand why, when I changed the model, the controllers properties didn't go back to what they were declared as at the beginning of the controller. From #8:<blockquote>Second, it mutates the item’s rating in the component. This leads to scenarios where it is hard to see why a certain property changes. Imagine we have another component in the same template where that rating is also used, for example, for calculating the average score for the soccer player.</blockquote> The post is very vague on what the problem with this is. A real advantage of the preferred solution is not shown. Balint lives on the cutting edge of technology, and has been practicing TDD since before it became popular. He was a classic PHP developer, and has since moved on to Java, Python, and Ruby. Currently, he is in love with Ember.js. He is fascinated by functional programming and also enjoys Clojure.